James Randon ran one of the fastest 1,500m times in the nation at the Virginia Challenge on Saturday. The Yale junior finished third in the competitive race – won by the NCAA mile champion Henry Wynne of Virginia – with a new personal best time of 3:40.15, improving his previous mark by 3 seconds. The time is the fifth fastest in conference history and the fourth fastest time of the overall weekend. Randon’s time also ranks him fifth in the NCAA. Zach Menchaca was a part of two conference leading marks this past weekend at the Larry Ellis Invitational. 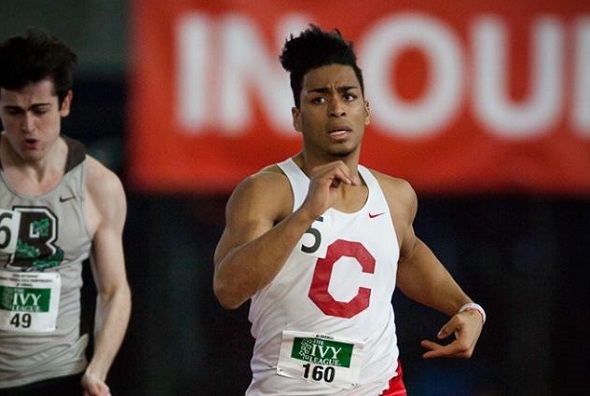 He finished third overall, second collegian in the 100m in 10.61 (wind-aided 2.8 m/s) and ran the anchor leg of Cornell’s victorious 4×100 relay. The 4×100 race was a previous of what is to come at Outdoor Heps as Cornell’s quartet of Ryan Hynes, Larry Gibson, Alex Beck, and Menchaca bested Princeton’s top sprinting quartet – 40.43 to 40.62. Cornell’s time is the ninth fastest in conference history. Cecilia Barowski won two 800m races at the Larry Ellis Invitational. On Friday, the Princeton senior won the elite final – which included a number of professionals in the field – with her second fastest time of the season, 2:03.05. This 800m time is also the second fastest time in the country for the weekend. She came back less than 24 hours later to win the open 800m event with a time of 2:06.99. Taylor McCorkle also won two races at the Larry Ellis Invitational. The Penn sophomore claimed the 100m and 200m events in times that were new wind-legal personal bests. Her 11.71 100m time ranks as the tenth best time in conference history, while her 200m time of 23.98 is just 0.02 seconds outside of the all-time top 10 for the event. Penn freshman Olivia Ryan earned her first collegiate win at the Larry Ellis Invitational, where she won the 3,000m by being the only athlete to go under 10 minutes. She won the event by almost 4 seconds with a time of 9:59.64. This entry was posted on Tuesday, April 26th, 2016 at 2:35 pm. It is filed under Athletes, Spotlight. You can follow any responses to this entry through the RSS 2.0 feed.